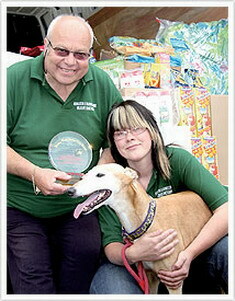 On June 17, Golden Year 6 (2009), our Association members had the honor of meeting one of this world's heavenly creatures when they traveled to Nuneaton in England to present the Shining World Loving-Care Award on behalf of Supreme Master Ching Hai to Jasmine the Greyhound. Jasmine was found abandoned in 2005 and was brought to Nuneaton Warwickshire Wildlife Sanctuary, where she has been under the devoted and loving care of Geoff and Stacey. Her condition soon improved, and she turned out to be the most caring and grateful resident at the sanctuary. To this day, she immediately takes charge of any orphaned animals that arrive at the site and is always eager to greet visitors, especially children. Jasmine showers the baby animals with motherly love and comfort, and keeps them clean and warm, which is most beneficial for their healthy development. Over the years, she has been surrogate mother to five fox cubs, four badger cubs, fifteen chicks, eight guinea pigs, two puppies and fifteen rabbits. Recently, the 50th orphan to come under her care was a young deer. 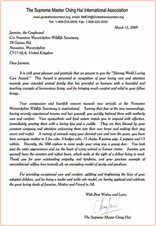 To applaud and celebrate Jasmine's great loving deeds as mother and friend to all, Supreme Master Ching Hai bestowed on her the Shining World Loving-Care Award. Master wrote these touching words in Her letter. “You look past the outer appearances and see the heart of every animal or human visitor. 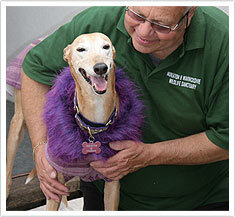 Jasmine, you yourself have the sweetest and softest heart that melts at the sight of a fellow being in need.” In addition to the Award plaque, Jasmine also received a beautiful coat, a lovely dog bed, US$200 worth of green veggie bones, plus US$5,000 in veggie and vegan food for the animals at the sanctuary. Geoff and Stacey were given Master's international best-selling publications, The Dogs in My Life, The Birds in My Life, and The Noble Wilds along with DVDs and CDs. What a truly kind soul Jasmine is, to selflessly nurture these orphaned babies! May all animals be appreciated and provided the loving care they deserve, for they really are Heaven's blessing to us all.